Sentinels gather at the shore to learn about coastal erosion. Throughout the fall of 2014 the Sentinels of Shoreline change were at it again. Starting with NOAA’s marine debris field guide we tailored a data collection protocol focused on plastic debris. Plastic debris in in the oceans has been a growing issue figuratively and literally. The Great Atlantic Garbage Patch hundreds of miles off the northeast coast of America is getting bigger and more attention is being paid to this and other garbage patches in our oceans. Along shorelines plastics are continually being washed onto beaches and back to sea. 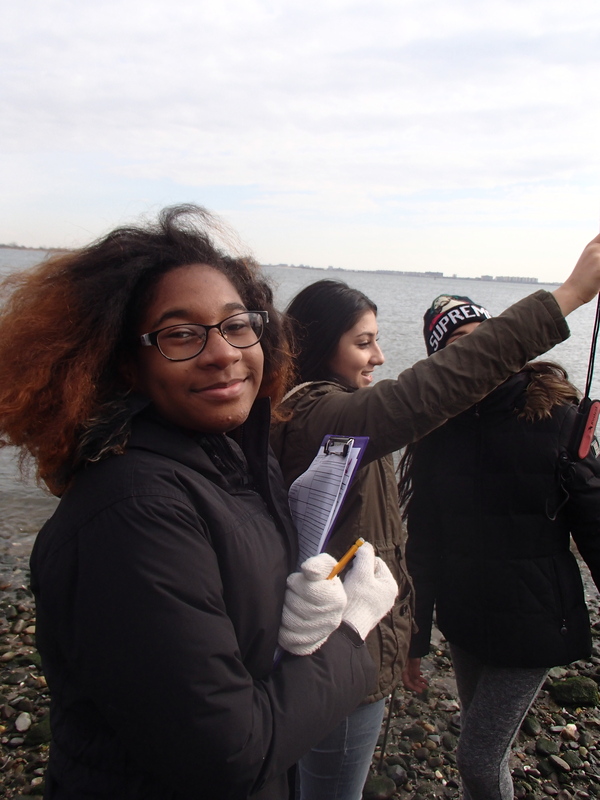 A group of NYC educators and their students, in collaboration with the National Parks Service and Brooklyn College, took surveys of the plastics found on shorelines around Jamaica Bay. Students were given an introduction on the impact that shoreline stabilization structures have had on our beaches. Shoreline structures are often built along beaches that are losing sand due to erosion. Structures such as groins, jetties and seawalls alter the effects of the oceans waves. Unfortunately, they can also cause down-coast erosion issues. Students were asked to think about how these issues might affect the debris that washed up on shore. Working in groups, students catalogued the types and quantity of plastics they collected in an area of the beach, which was measured and tracked using GPS coordinates. Though some days were colder than others, all of the groups worked diligently and felt a real sense of accomplishment at the end of the day. The effects of their hard work were immediately visible in the beautifully cleaned shorelines. Students also need to be able to understand local impacts before being able to grapple with global problems. So they were asked to take their survey skills home and find out how the plastic they collected on the beach related to them personally. By carefully tracking the plastic they used and discarded over a week students could then make underlying connections between themselves and the global plastic issue. 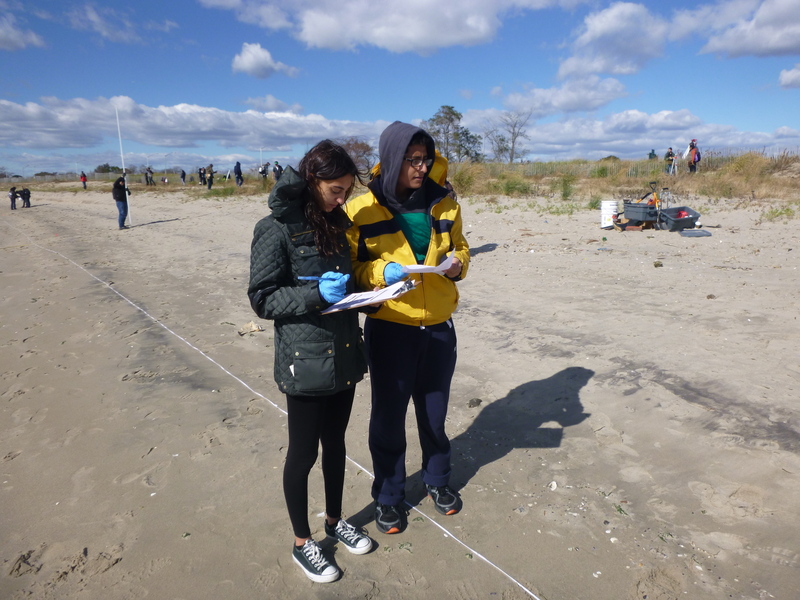 Using the data they collected at home and on the beach some of the students from Brooklyn College presented posters at the Macaulay Honors College. A few entertaining PSA videos were also made to advocate recycling! It is true the growing gyres of plastics in the ocean have been a concern for decades. However, quantifying how the local environment impacts them, and vice versa, is a continuing expedition. The Sentinels are continuing their work in the field to expand the database, including more shorelines. Ultimately this will help us to understand how the plastics we use end up in Jamaica Bay and the world’s oceans. Taking us all one step further in our quest to gain the knowledge required to begin finding solutions to our global plastic pollution problem.